The massive wingspan of a Bald Eagle is widely spread as he prepares for touch down in order to grasp a meal around Homer, Alaska. With sharp talons fully extended in preparation for a touch down on the surface of the water, this Bald Eagle in Homer, alaska (link to alaska pictures) is likely to bring out his next meal. With amazing eyesight that is about four times sharper and clearer than humans, a Bald Eagle can spot any prey from hundreds of feet above the water, swoop down and make a successful catch. 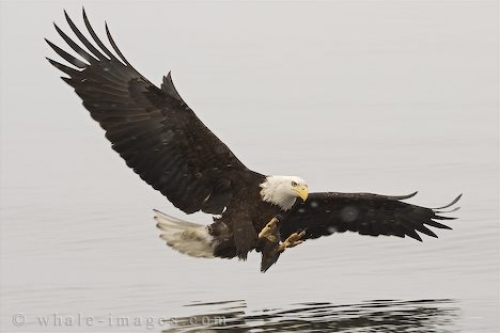 A Bald Eagle is extremely powerful and very in control when preparing to attack, but in reality, they are only able to lift approximately four pounds out of the water around Homer, Alaska. If they find a fish that is too heavy for them to carry, the Bald Eagle may allow itself to be dragged into the water as it refuses to release its meal. Photo of a Bald Eagle ready for touch down and a fine meal amongst the fog surrounding Homer, Alaska in the USA. Considering a fully grown Bald Eagle can weigh between seven and fifteen pounds, a four pound carry tells you how much power they have. The wing span of a Bald Eagle can reach a width of between six and eight feet and to see these amazing symbolic birds in their natural environment is something very impressive and worthwhile. To watch a Bald Eagle in action, there are special locations and precise times throughout the year in areas like Brackendale in British Columbia, Haines and Homer, Alaska. Here you can spend hours watching a Bald Eagle and his hundreds of family members take flight soaring the skies, perched in tall trees or preparing for touch down ready to pluck another fish out of the water.